Inking on the Edge: My Favorite Things Stamps...August Design Team Creative Challenge...Mini Books! 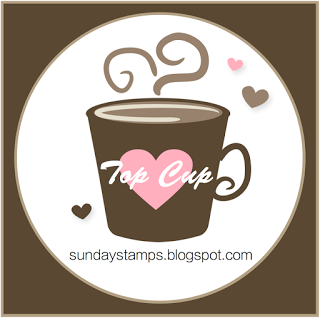 My Favorite Things Stamps...August Design Team Creative Challenge...Mini Books! 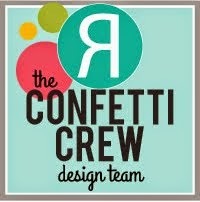 Welcome to The MFT Design Team Creative Challenge, this is a monthly feature, where we are challenged to explore our creative side using a specific theme, product, or technique. This month, we were challenged to create a mini-book. 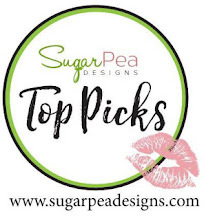 Be sure to check out the MFT Blog for a list of all participating designers who have put their MFT stamps and/or Die-namics dies to work to create a mini book for you today! 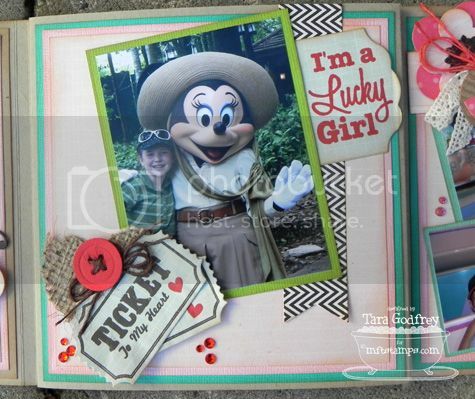 It was such a great opportunity to do a little scrapbooking again...it has been so long since I did any and a mini-book was the perfect way to get my feet wet again! 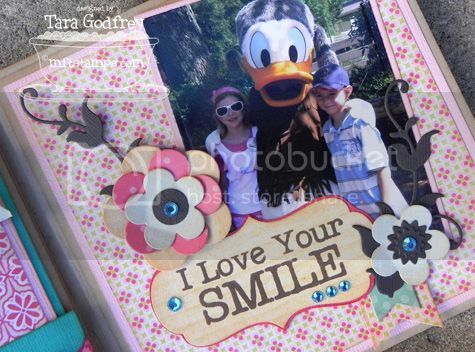 It was also the perfect time to use these pictures that we took 3 years ago when we went to Disney for Hannah's 10th birthday! I had originally intended to make a 12X12 album of this trip but I kept putting it off as I find 12X12 a little overwhelming now after working on 6x6 cards. This smaller 6x6 flip book was perfect size for me to preserve these Disney memories and I really enjoyed the trip down memory lane. 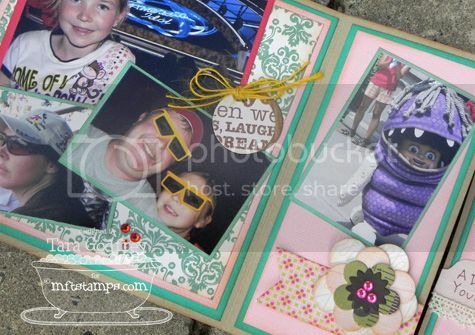 I have to say that my husband was also very happy to see me scrapbooking again...he always love seeing the end result. I have made this kind of flip book before and it is so easy. I think this Flip book pattern has been around for ages so I didn't include a tutorial and I already have a ton of pics for you in this post. One little note about my book...in the past I made a book like this using a sturdy double-sided patterned cardstock paper but this time I decided to make it from Kraft cardstock. I'm happy with how it turned out but unfortunately it is a little too think. I think I added too many layers (go figure) and now it is kind of bursting at the seams and doesn't want to close. So here we go...I have lots of pics so bear with me...these are the first 2 pages as you flip open the book. I made this Mini Flip book 6x6 from Kraft cardstock and Echo Park, This and That, Graceful 6X6 and 12X12 papers. On the cover I Stamped a sentiment from the Big Greetings Stamp set on pattern paper cut with the Fishtail Flags STAX Die-namics. 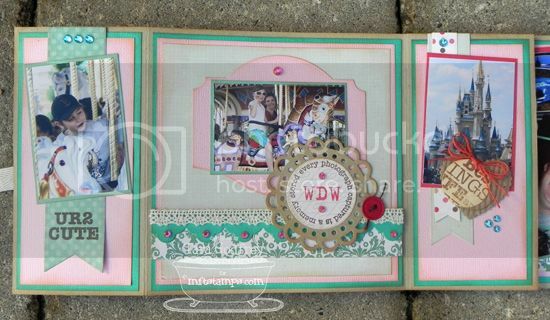 I also used the Pretty Posies Die-namics and the Circle Tag from the Let's Toast Die-namics. I stamped the number 10 from the First Place Award Stamps set. I also used part of a sentiment from the PI Cute-a-tude Stamp set and stamped it on a mini Bracket Tab from the Mini Tab Foursome Die-namics. I used Medium Simply Scalloped border Die-namics, Pretty Posies Die-namics, the Leafy Flourish Die-namics and stamped a sentiment from the Clearly Sentimental About Audry Hepburn Stamp set on pattern paper cut with the Fishtail Flags Die-namics. On this page I used the Open Scallop Doily Duo and another flower with the Pretty Posies Die-namics. I stamped the sentiment from the More Essential Sentiments stamp set on pattern paper cut with the Fishtail Flags and I used used the Just the Ticket Stamp and Die-namics set. On this page I used the Pretty Posies Die-namics and Leafy Flourish Die-namics again. I stamped a sentiment from the Complimentary Greetings Sentiment set, the Framed Greetings Die-namics and a few more Fishtail Flags. 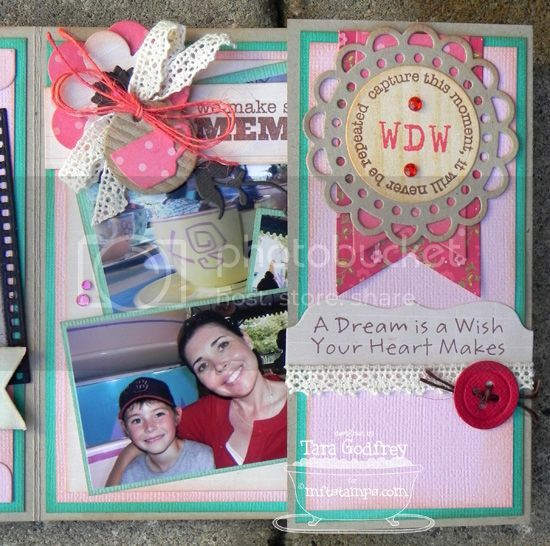 On this page I used the Just the Ticket Stamp and Die-namics set again and the Fishtail Flags Die-namics. I cut a heart from burlap material with the Hearts of Plenty Die-namics and added a button with Button Quartet Die-namics. I stamped this sentiment from the Girly Graphic Tee Stamp set and stamped it on a portion of the Vertical Greetings Die-namics. 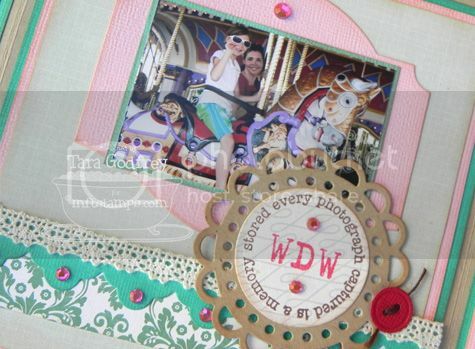 On this page I used the Open Scallop Doily Duo again and my Circle STAX Die-namics. I cut hearts with from burlap material and corrugated cardstock with the Hearts of Plenty Die-namics and added another cute button cut with the Button Quartet Die-namics. I used the new Triple Scallop Border Die-namics and a sentiment from the Clearly Sentimental About Audry Hepburn. I also used the Square and Rectangle STAX Die-namics to cut out my larger pictures and to make the mats. They are perfect for this and cut the photos perfectly. On this small flap I used the Fishtail Flags STAX Die-namics, the Open Scallop Doily Duo and the Circle STAX Die-namics. 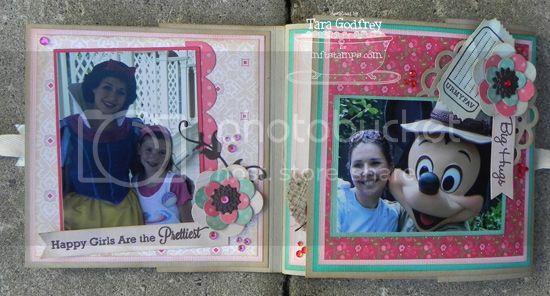 I used the Behind the Camera Stamps and Die-namics Stamp Set and the Typewriter Alphabet stamp set to and in the WDW to customize my Disney album. I also stamped a sentiment from the Pure Innocence Naptime on the Bracket Tab Die-nmaics. This is the middle of the book totally open. I think this is my favourite page in the book...I stamped a sentiment from the Behind the Camera Stamp Set on pattern paper cut with the Fishtail Flags. On the side flap I stamped a sentiment from the Vertical Greetings on the Vertical Greetings II Die-namics. I add a little embellishment cluster with the Pretty Posies Die-namics and the Circle Tag from the Let's Toast Die-namics and the little tea cup is from the Always Time for Team Die-namics. On this flap I stamped a sentiment from the Vertical Greetings II Stamp set on the Vertical Greetings Die-namics and the Fishtail Flags Die-namics. Here I used the Fishtail Flag Die-namics and I stamped a sentiment from the Say What Stamp Set. I used the Open Scallop Doily Duo Die-namics again with another sentiment from the Behind the Camera Stamps set and I used the Typewriter Alphabet Stamp set again. 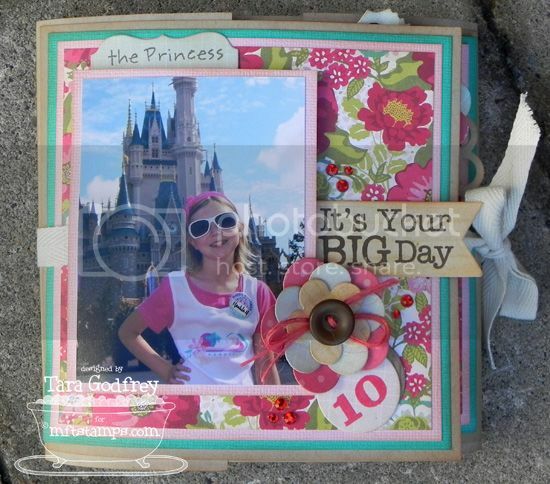 I also used the Designer Label 3 STAX Die-namics and the Triple Scallop Border Die-namics. On this flap I used the At the Movies Die-namics and a sentiment from the Behind the Camera Stamps set. When you open the flaps it reveals this section. Here I used the small circle tag from the Let's Toast Die-namics and I stamped just a portion of one of the stamps from the Vertical Greetings Stamp set. 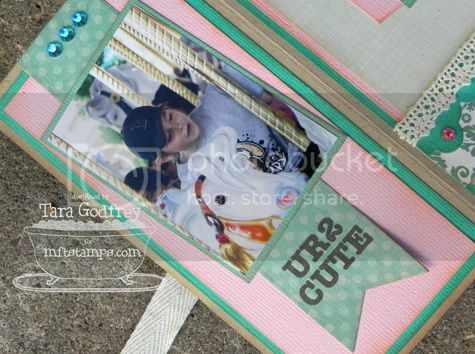 I also used the Fishtail Flags and Pretty Posies Die-namics. I also stamped a sentiment from the Pure Innocence Fairy Girl stamp set. Congratulations....you made it to the end! 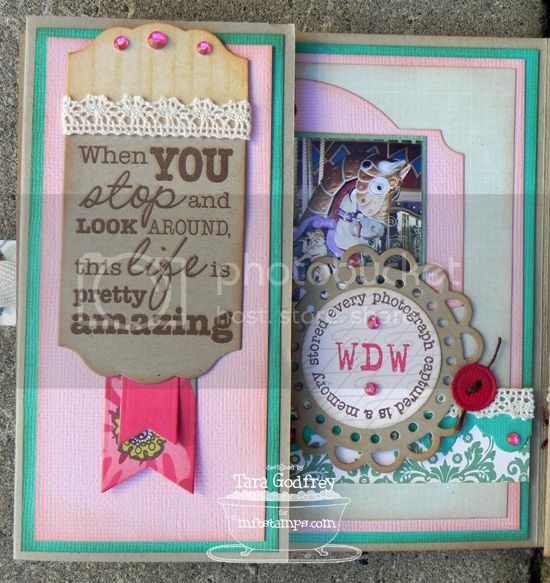 Thanks SO much for sticking with it and for stopping by and having a look at the Mini Flip Book that I made for this month's MFT Creative Challenge! I hope that it encourages you to use your MFT Stamps and Die-namics for your mini-books, albums and scrapbooking pages. I have lots of pictures left over that I couldn't squeeze into this mini book but this project has sparked my inner-scrapbooker and I think I will be tackling that 12X12 album that I was planning on making after all. 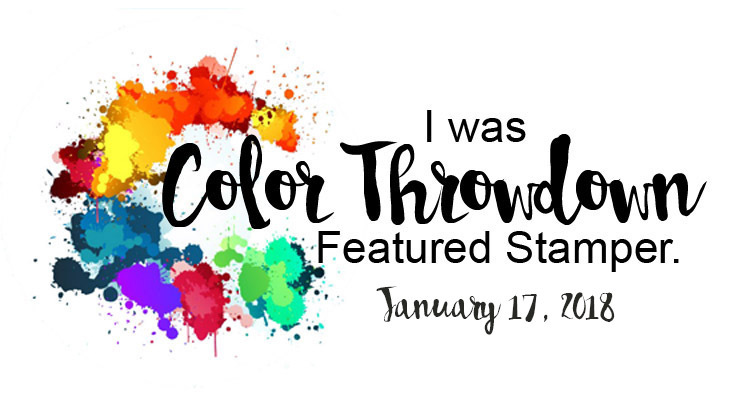 Now, head on over to Kim's blog for links to all the MFT Designers who have taken this Month's Creative Challenge and created gorgeous mini-books...I know you will be inspired!!! This is incredible, Tara! 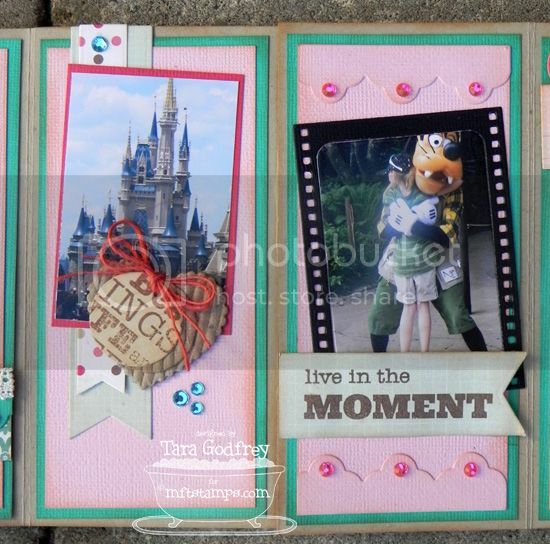 I love all the elements you added to each page and the sentiments are absolutely perfect. :O WOW! This is incredible tara!! What an amazing creation I just love every page...beautiful layouts/layering/details...everything! 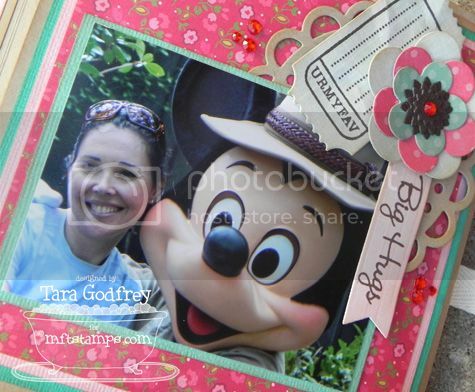 such a gorgeous album Tara, looks like you all have a wonderful time at Disneyland. What a darling mini album! You used all the dies in so many great ways. Love this, Tara! Fabulous album! What a wonderful way to preserve these memories! Oh my Tara! What a darling mini! 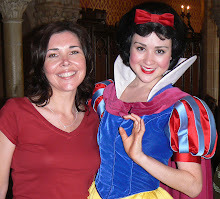 I love all the fun photos from your trip to Disney! 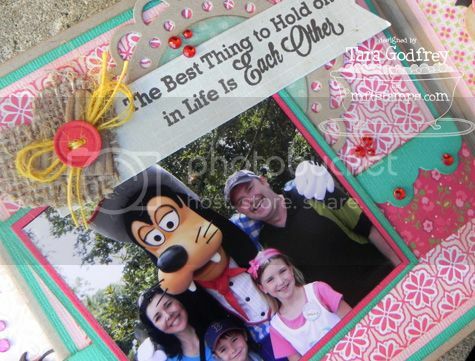 What a sweet and cheerful keepsake to be treasured! What an awesome mini album and a great way to save those precious memories. What a great album! 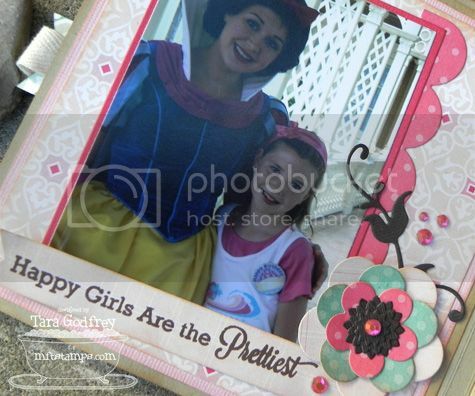 We are heading to this happy spot next week....love how you managed to put Disney photos together in a very NICE album...sometimes tough to do with Disney photos. Awesome! Tara, this is fantastic! I love all the bits and pieces -- the tea cup on the corrugated circle -- all of them! How gorgeous Tara! Love it! I love this and all the little details and elements you added, so fabulous. This is so cute! My husband and I went to Disney for our honeymoon. It makes me wish I was there again. Absolutely gorgeous Tara! 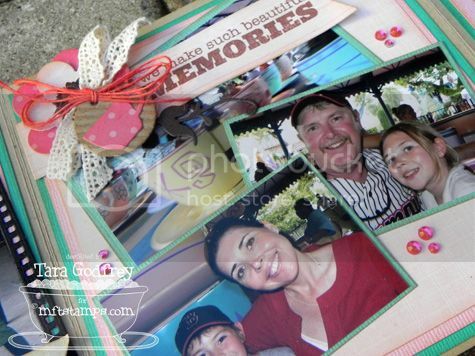 Looks like your trip was full of fun filled days and many special memories!